On the morning of the General Election, Thursday 8th June, I supported a parent in a meeting with her school’s Headteacher. We were discussing her complaint that the school had done absolutely nothing about her child’s special needs for nearly two years, since joining in Year 7. I presented to the Headteacher a checklist of the 13 core duties set out in the Code of Practice for pupils at SEN Support. He looked blank. None had been addressed in 20 months, despite the parent having alerted the school on admission with a copy of the IEP from her primary school. After dozens of enquiries and an educational psychologist’s assessment (paid for, inevitably, by the parent), the girl still wasn’t on the SEND Register, hadn’t been assessed in school at all, received no relevant support and her needs were unknown to her 14 secondary school teachers. Nothing in the school’s mandatory SEND Information Report was up to date or of any use to the parent. The school had not referred to the LA’s Local Offer nor were they familiar with it. The SENCo had no personal knowledge of her needs and in five school terms, he had offered no comment at all on the nature of her difficulties. I made all of this plain, in the rather blunt and brief way that I do. But this is happening in schools and colleges, in every town and village in England, every week. On the same morning, I dealt with an email from the Head of a local authority’s Educational Psychology service to a parent, telling her that schools decide which pupils should have an EP assessment for their transfer to EHCP. This kind of mischievous myth-making has become commonplace since the Children & Families Act was passed three years ago. I challenged her on it immediately and in due course I will refer it to the Department for Education. Meanwhile, a family I’m supporting in London are almost at the end of their 2 month wait for mediation to avoid an appeal to the Tribunal. You’ll remember the DfE recently trumpeted the effectiveness of their disagreement resolution services. I say the family are “almost at the end of their 2 month wait” because they’re giving up. Despite our weekly calls and emails, the Local Authority has failed to offer any dates for mediation and we will go to appeal. What a waste of time, money, skills and opportunity. "At every age and stage of development, in every type of school and college, with every pattern of disability, children are being let down." Monday: 4,050 children with Statements or EHCPs are without a school, more than double the previous record, set last year. So this problem is escalating very rapidly. These are among the nation’s most vulnerable children and they are receiving no education. Now that Theresa May’s dream of offering a select few the enriched opportunities of a Grammar School is probably over, focus on understanding why these 4,050 get no education at all and issue a directive to every LA in the country to ensure that every child with SEND has a school place which meets their needs. This won’t require legislation – it’s already the law. It needs to be enforced. Tuesday: City analysts predict a soft-Brexit and a slight relaxation of austerity, meaning the government may have a little more spending power. Don’t waste it on contracts for consultants and expensive vanity projects: get it into schools so they can afford to keep their SENCO working in SEND, not teaching full-time. That way, at least some of the good intentions of the reform may be realised. Thursday: The Lenehan Review of residential placements is progressing. But the focus needs to be on the safety of Assessment & Treatment Units and the wrongful placement of young adults with SEND in care homes who should be attending specialist colleges, rather than casting doubt on the future of those specialist colleges when they will most be needed. This country has superb provision for children and young adults with profound and multiple learning disabilities and sensory impairments: set up regional networks to support and enhance these facilities so they can improve their teacher recruitment, training, therapeutic practice and impact evaluation. Friday: SEND reform is due to be completed in April 2018. As my opening remarks show, in the mainstream at least, the job has been botched. Lee Scott understood the problems acutely in his research last year. Lock him in a room with a team of SEND parents, SEND governors and Headteachers until they agree a plan to sort out SEND in the mainstream. Then pin that plan to your desk and don’t make a single speech, anywhere, until it’s implemented. Until you’ve done something about the rubbish that SEND parents deal with every day just to get what others receive automatically, we don’t want to hear you. Saturday: YES, you are working overtime because the job isn’t done until the paperwork is finished. Get used to it. Draft an order that requires all LAs to use the same template for EHCPs, designed by parents, so that every Plan can be evaluated to the same standard. Sanction LAs who do not comply. Task Ofsted with sampling EHCPs from every LA as part of their inspection programme. Ban out-sourcing of EHCP writing and set a cap on Local Authority legal services budgets so that parents don’t face celebrity barristers at Tribunal – parents are doing enough already without the state using their taxes to prevent them getting the right education for their children. Oh, and before you leave the office, write a note to yourself never to call SEND parents “agitators” – they are the only people keeping the system working. Sunday: take the day off; spend it with parents and carers of SEND children who will be working as hard as they do every other day to give these children a rich and fulfilling life despite every challenge that birth and bureaucracy can place in their way. If you’re not sure where to find them, try Facebook. They may let you go home early in the evening if you’ve done everything on this to-do list. 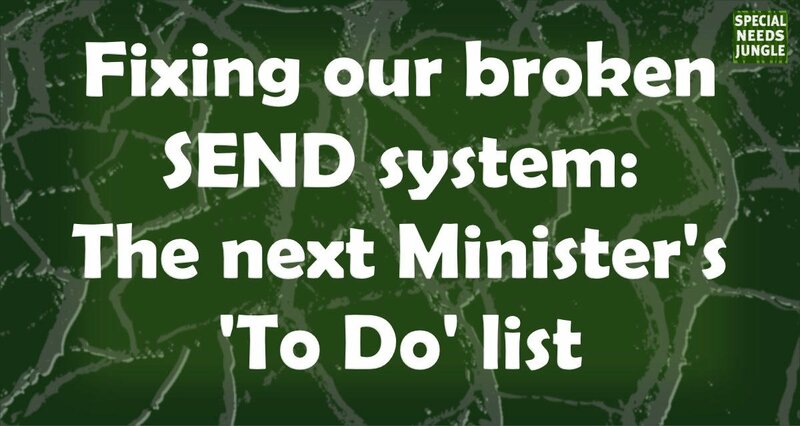 Want to know more about what we think needs doing to put SEND right? Read our SNJ election manifesto.